​Sam Tomkins admits it will be a “strange” feeling returning to the DW Stadium to face his former club this weekend. 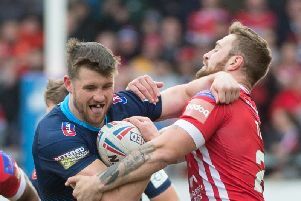 The ex-Wigan Warriors star will fly in to town with his new club Catalans Dragons for Sunday’s eighth round Super League clash. “I’ve never played against Wigan before,” he said: “The DW was my home for many, many years so it’s going to feel strange playing against my friends. Tomkins has signed a three-year deal in Perpignan and has quickly settled in to life in the south of France. But he has kept an eye on his old club’s fortunes, with problems on field mirrored by the ongoing Shaun Edwards saga off it. Tomkins said: “Wigan have had a bit of a rocky start but I’m sure they’ll be there or thereabouts at the end of the year. “I know there have been a lot of things going on off the field at the club recently but that doesn’t affect the players. “When form is not so good or results go the wrong way people outside the playing group will use those things as an excuse. Tomkins says he will give coach Steve McNamara the inside track on Wigan as they prepare for Sunday’s game. He said: “Hopefully, knowing the Wigan players so well, I might be able to give us an insight on how to beat them. The Wigan club is very proud of the way they play at home, just like we are here in Perpignan. “They will want to make sure that, off a good win against Salford, they can back it up this week so we know we’re up against it. “I know the Wigan players will be focused on getting the win. They’ve not been that far off recently, if you look at the number of tries they’ve conceded there’s not as many as you’d think. “We’ve actually conceded more tries than they have but we’ve had a few more wins.